“The Supreme Court would be improved by having more members under 40.” Discuss. Big Voice Participants. Alex is at the back. The essay below was written in response to a competition run by the Big Voice Project with the support of the UKSC Blog. 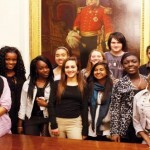 Big Voice is a youth project working with teenagers to explore issues of legal identity and the democratic legitimacy of the legal system within the UK. 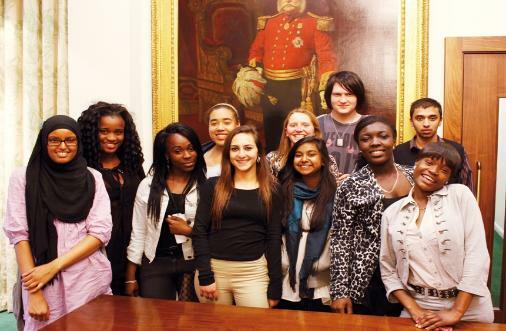 The project seeks to empower young people, who may feel distanced from the world of courts and lawyers. The essay below was written by Alex Muscovici, a student from City and Islington Sixth Form College. Currently the UK Supreme Court has twelve justices and the youngest, Lord Kerr, is 63. The eldest, Lord Brown, is 74. This shows that the highest court in the land is being led by a group of relatively elderly individuals. This raises a number of issues, both positive and negative. The reason that the UK Supreme Court (and the equivalent in many other parts of the world) has relatively older members is due to their experience. This makes me feel assured that the Justices of the Supreme Court, after years of studying and practicing the law, are more than capable of delivering justice to the people. But, could having younger justices be a good idea? I believe that it could be, but I recognise that there are also a number of potential problems with this. As a young person, I feel that having fellow young people involved with the Supreme Court would be a positive thing as they could better represent my age group. Also, diversity in any form could provide the Justices with an insight into other life-styles. Giving the Justices an insight into “young” life, which is unfathomably different to how it used to be, could impact on Court decisions: it could make them of mammoth or trivial importance. This idea could be applied to any group of any kind and one could argue that we must have other minority groups on the Supreme Court for the same reason. There is an argument to say that diversity reduces ignorance and may therefore lead to more knowledge when Court decisions are made. However, there are perfectly good counter arguments to this which must also be considered. The previously mentioned issue of experience must be brought into question. Could a Justice of, say, 30 years of age have enough knowledge and experience of the law to make a valid and just decision? Personally, I doubt it. Accordingly, weighing a lack of experience on the one hand and diversity on the other on the same scale leads me to a swift and facilitated decision on the matter: I personally feel that a non-diverse, experienced panel is much better than a diverse panel which lacks experience in the law. I believe that on the legal battlefield, prior knowledge is a greater weapon than your age or culture. There is another problem with having younger justices. My personal opinion is that in principle it would be a good idea to have them, but how would it work in practice? Would it merely be a case of recommending the selection of a justice, or would it be necessary for there to be “positive” discrimination in mandating the selection of younger justices? Frankly, both are ideas that are unlikely to work, with the latter being a potentially dangerous route to follow. Would it be right for an experienced, older judge to lose their job as a Justice so it can be given to an inexperienced, younger judge? Not in my opinion. And surely if this is done on the basis of age it must be done on others such as sexuality, race, or gender. For twelve Justices, there are too many minority groups for the Court to represent. The point of representation brings me to another question, namely whether it is the Court’s role to represent the people. In England, we have, as our main legislature, the House of Commons, which is there to represent the people directly. The people of England vote on the candidate they believe will represent them best in Westminster. British citizens are represented by their MPs, not their judges. It is not the job of Justices to represent the population; they are there to make legal decisions. Justices are there to interpret the law, not represent the people. To summarise, I do believe that the Supreme Court would benefit in some way from having younger justices, but mandating this practice would open a Pandora’s box of debate and arguments (including over potentially trivial matters). To conclude, it is my view that the Supreme Court should concern itself less with the matter of diversity and more with the matter of ensuring justice and freedom in our so-called democracy. Leave a reply on "“The Supreme Court would be improved by having more members under 40.” Discuss."